BOTANICAL COMPOSITION: Multiple deciduous shrub, rarely a tree, whose height usually reaches 1-3 m, and sometimes 3-6 m, up to 15 m. Young shoots are silvery, pubescent; perennial - covered with dark brown, almost black bark. Short shoots are with numerous long spines. Shoots of different ages create a rounded, pyramidal or spreading crown. 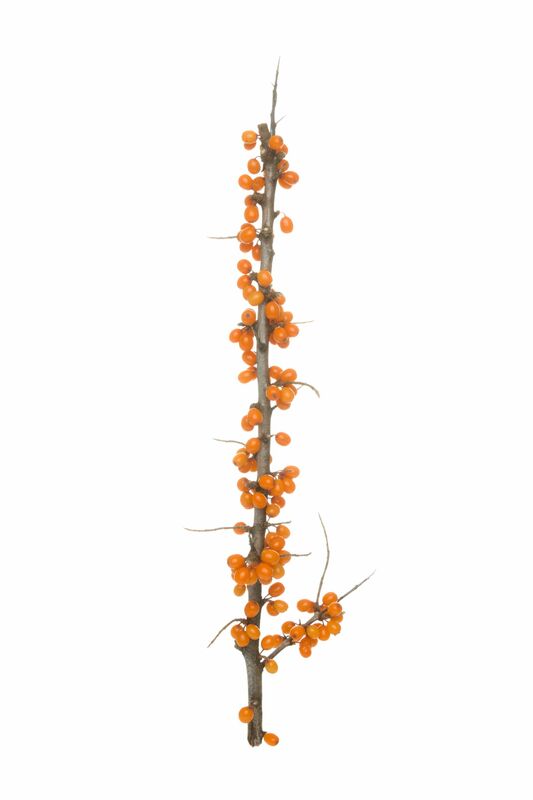 The sea buckthorn root system develops close to the surface, not deeper than 40 cm, spreading over a wide area. Leaves are alternate, simple, linear or linear-lanceolate, above grayish-green, brownish below or yellowish-silver-white. Fruit is an oval or round smooth drupe of yellowish-golden, red or orange color, with one pit, shiny, juicy, with a peculiar taste and smell, reminiscent of the smell of pineapple. Pit is oblong-ovate, sometimes almost black, shiny. CHEMICAL COMPOSITION: The fruits of sea buckthorn are classified as multivitamin. They contain provitamins A (up to 10.9 mg%) and vitamins (B1, B2, B3, B6, C, E, K, etc.). Fruits contain 3-6% sugars (glucose and fructose), organic acids (up to 2.5%) - malic, tartaric, etc., tannins, yellow coloring pigment quercetin, fatty oil (9% in pulp, 12% in pits). Serotonin (up to 0.4%), ascorbic acid and up to 10 different tannins were found in the leaves and bark. HEALTH BENEFITS: Hippophae rhamnoides improves lipid metabolism, increases the protein content in the liver, prevents infectious diseases, stimulates the recovery processes in damaged tissues, normalizes activity of the nervous system due to serotonin, removes excess urinary and oxalic acid from the body, increases potency. INDICATIONS FOR USE: Sea buckthorn is effective when having gout, acne, common cold, digestive tract infection, reduced acidity of gastric juice, cancer, scurvy, sunburn, arthritis, diarrhea, vision disorders, dry eyes, cough, angina, burns, wounds, asthma, dialysis, purulent diseases, atonic constipation, cuts, dry skin, cirrhosis, heartburn, aging, aging skin, nephrotic syndrome, duodenal ulcers, high cholesterol, high blood pressure, frostbite, atherosclerosis, eczema, heart disease. SPECIAL WARNINGS: Don’t use sea buckthorn if you have any bleeding disorders. Put an end to consumption of this plant before surgery. To protect yourself from potential risk, don’t use it during pregnancy and breast-feeding, as there is no proven scientific information about taking sea buckthorn during these periods. Don’t take Hippophae rhamnoides if you have low blood pressure. DRUG INTERACTIONS: Sea buckthorn may interact with medications that slow blood clotting. Tea: pour 1 glass of boiling water over 5 g of dried leaves. Brew for 10 minutes. Strain and enjoy. Decoction: add 3 tbsp of berries to 500 ml of boiling water. Steam for 10 minutes. Then strain. Take 2-3 glasses per day. *This article is for informational purposes only. We suggest consulting with a physician before using these or any other herbal supplements.